My kids love fruit leathers, but they are so expensive at the store. So now I make my own. It’s so easy and you can add in whatever fruits and spices you like. 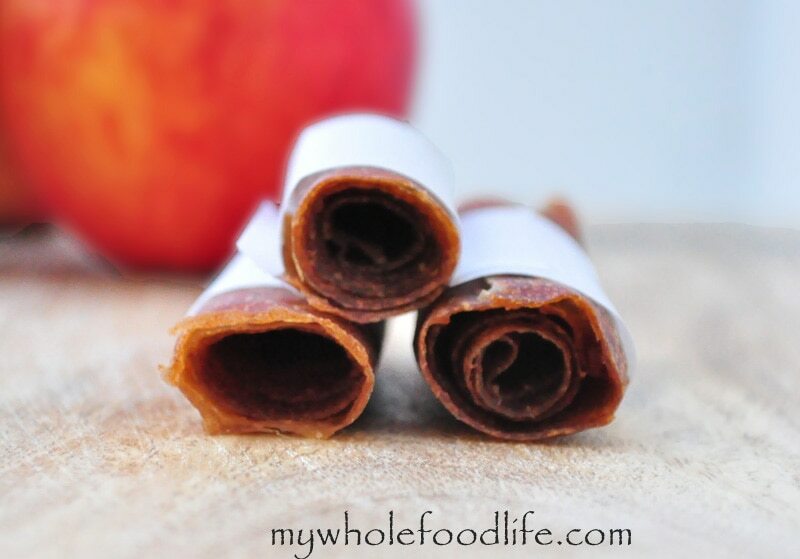 I have peach fruit leathers on my blog already, and now I can add these to the list. The house smells amazing when these are cooking, kind of like when I make my crock pot applesauce. The best part is that you probably already have all the ingredients in your own cabinets! I used applesauce to make mine, but you can most certainly use real apples and puree them first. Think about it though. When your store has a sale on applesauce, you can stock up and make these. It would save a lot of money and make your kids happy too. I used a dehydrator to make mine, but you can certainly try this in the oven as well. You just need to keep an eye one them. If using an oven, preheat to the lowest setting or 135. Line your baking sheets with parchment and spread the mixture out evenly. Bake for about 4-6 hours, depending on how low the temp your oven will go. If you are using a dehydrator , line the trays with parchment as well. You can use the dehydrator sheets as well, but I think parchment is much cheaper and works great. I baked mine in the dehydrator at 135 for about 6-7 hours. Once it feels tacky, it’s pretty much done. I got about 20 fruit leathers out of my batch. Enjoy! Sounds delicious! I call fruit leathers 'candy' at my house lol how would you storethe leftovers and how long would they keep? Do you think you could freeze them? I store the leftovers in a container in the pantry. Some people store them in the fridge. Not sure if you can freeze them or not. Mine never last long, but I imagine they last a few weeks. Thank you again Melissa. I made peach rollups yesterday, getting ready for school lunch. I will make these today. You're welcome Joyce! I hope you enjoy these as well. This reminds me that a friend of my parents' made and shared a similar applesauce version of fruit leathers to take on hiking trips. My kids loved them so I will have to make some for school lunches and snacks for sure! Oh YUM! I love fruit leathers and never thought to make homemade ones! Good day if I don't have a dehydrator...can I bake this in the oven? thanks looks fab.. Thanks! Yes you can. Just use the lowest setting and watch it carefully. How's thick do you recommend it be spread on the baking sheets? Pretty thin actually. Maybe 1/4 inch? Have you used your homemade applesauce for this recipe instead of the store brand? Yes, but you will need to blend it so it's completely smooth before using in this recipe. What type dehydrator do you own? Ours died & the hubby wants another one. These sound good, but here it will be way too hot in a couple months to use the oven.